St. Louis A to Z: Kemper Art Museum and Kiener Plaza - JP loves LIFE! Two really different places come to mind with the letter K — Kemper Art Museum and Kiener Plaza. This one came to mind fairly quickly and yet I haven’t been there yet so Kemper Art Museum is on my to-do list! The museum is on the campus of Washington University and offers artwork from multiple centuries since it has been actively building its collection since the 1800s. It’s kind of cool to know they have Jackson Pollock and Willem de Kooning — heck there is even a YouTube video explaining de Kooning’s Saturday Night. The museum, in keeping with many in St. Louis, is free to the public. The green strip (seems to be officially called the Gateway Mall) that starts at the Arch and goes up through much of downtown St. Louis is home to lots of special events, and it seems the majority of them start at Kiener Plaza. 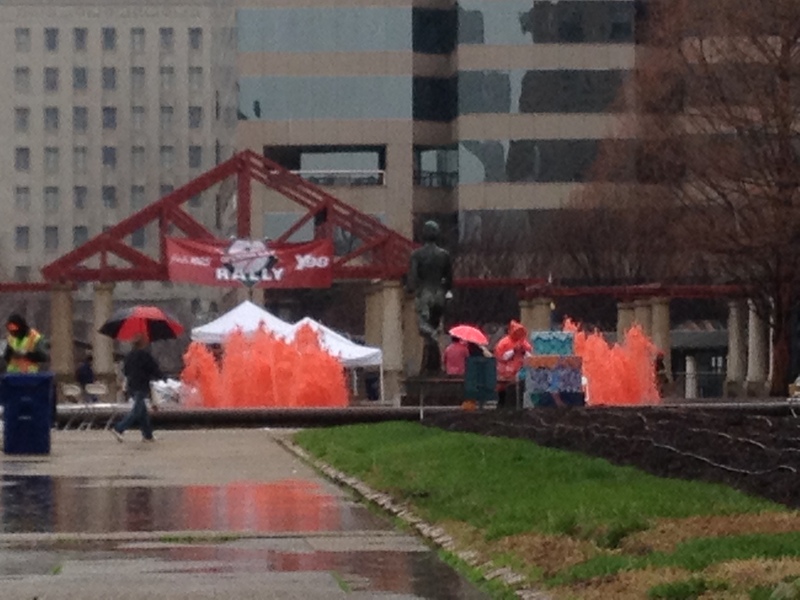 Last week when I was downtown it was the celebration of the Cardinals home opener! 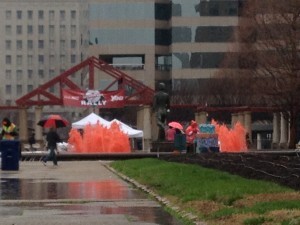 And for that, the water in the fountain was bright red! The A to Z series about St. Louis is almost back on track after some days of pushing! Next up is L! In the meantime, if you’d like to see how I challenged myself last spring, I did an A to Z of Agriculture and on K day, it was all about kale!